This year we held our workshop in close collaboration with Dr. Marianne Maghenda and Prof. Hamadi Boga from Taita Taveta University. Field courses were conducted in the agricultural landscape, plantations and cloud forest patches, around Ngerenyi Agricultural Campus of Taita Taveta University close to Wundanyi and in Chawia. The workshop took place during the 31st July and 1st of August (see our flyer announcing this activity). The university provided excellent logistics and delicious meals at TTU Makuti restaurant. 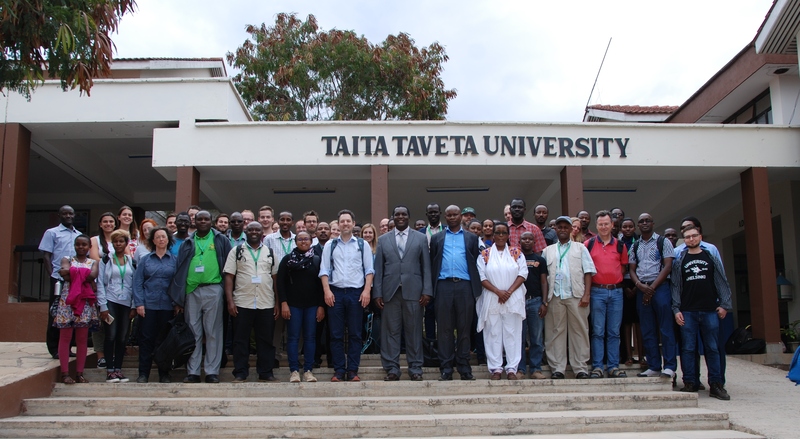 After the official opening of the workshop by various distinguished representatives of TTU, an introduction into the DAAD Quality Network Biodiversity Kenya was presented by Jan Christian Habel and Marianne Maghenda. The first thematic talk was given by Geoffrey Mwachala from National Museums of Kenya about the “Botany of the Taita Hills – insights from the rare plants of Kenya project”. This very enthusiastic talk introduced into the biogeography of Taita Hills, part of the Eastern Arc Mountains and one of the 35 global biodiversity hotspots. In the following, Ronald K. Mulwa from National Museums of Kenya provided an excellent overview of animal diversity of the Taita Hills. He explained the level of species endemicity, current conservation efforts, challenges and success. Main problem in Taita Hills is that major parts of indigenous forest were transformed into exotic tree plantations (mainly Eucalyptus spec.) as well as the clearance of indigenaous forest and its transformation into agricultural land (subsistence agriculture). Furthermore, the remaining forest patches still suffer under ongoing resource exploitation, such as the collection of fire-wood (main energy source for cooking). Find below some impressions of our workshop. In the following, various talks were presented about remote sensing and GIS applications to identify and quantify land-cover changes in Taita Hills. These talks were presented by Tino Johansson from University of Helsinki and Samuel Nthuni from Department of Geospatial and Space Technology of Nairobi University (UON). The forenoon was closed by a holistic contribution about the history of land management in the Taita Hills, with a main focus on the culture of the local people, given by Marianne Maghenda from Taita Taveta University. Her talk provided a holistic contribution, summarizing the challenges and potential ways how to improve life quality and nature conservation in the Taita Hills. In the afternoon we visited the Taita Hills and did an excursion around the Ngerenyi Agricultural Campus Ngerenyi of Taita Taveta University, close to Wundanyi. See some impressions of our excursion below. During the second day of our workshop, the supervisors of the working packages presented their goals, research questions, and reported from previous activities and results of Arabuko Sokoke Forest, conducted last year in close collaboration with Prof. Halimu Shauri and Dr. Ali Maarifa from Pwani University Kilifi. In a first thematic block, Tobias Bendzko (TUM), Gertrud Schaab (HsKA) and Marco Rieckmann (University of Vechta) together with Muthio J. Nzau (TUM) presented their working packages on social sciences, land-tenure, and the use of Apps to improve data collection in the field. Data on why environmental education matters can help to conserve resources and to increase human livelihoods. A talk by Mike Teucher (MLU Halle-Wittenberg) about “Airborne environmental observation (satellite and UAV based land-cover change detection)” linked natural sciences (land-cover data collection) and social sciences (impact of human behaviour on landscape structures and ecosystems). Find below some impressions of our presenters, Gertrud Schaab, Muthio J. Nzau, James Mwamgombe and Marianne Maghenda (from left to right). We then turned into environmental sciences, such as vegetation and animal ecology. Christine Schmitt (ZEF Bonn) and Peter Borchardt presented a talk about vegetation ecology, the impact of invasive species, and the so-called “donut-effects”, the exploitation of natural resources such as tree cutting in the interior of a forest patch (but not at the forest border), where illegal activities are more hidden by dense forest. Peter Borchardt (leading a similar DAAD Quality Network Biodiversity in Ethiopia, the ARBONETH) underlined the relevance of tree nurseries to train local people and to provide general environmental education, mainly supporting the replanting and reforestation of Taita Hills with indigenous tree species. A significant insight into the reality and practice of forest patch conservation in Taita Hills was presented by James Mwangombe from Kenyan Forest Service as well as by Paul Gacheru from Nature Kenya, the East Africa Natural History Society (EANHS). During the afternoon, we shifted from vegetation ecology to animal ecology, with a first, enthusiastic talk about butterfly communities given by Thomas Schmitt (Senckenberg Deutsches Entomologisches Institut Müncheberg). The last talk in this session was given by Kathrin Krausa of Ruhr University Bochum about the ecology and behaviour of stingless bees. The workshop was closed by a fascinating evening talk about “How Bodyguards find the attacker – Ants defend Acacias against browsers” by Felix Hager of Ruhr University Bochum. Find below some impressions of animal species in Taita Hills. The workshop was inspiring, interesting, and underlined two conservation challenges in Taita Hills: (i) The Taita Hills are ecologically very unique, and home of various endemic plant and animal species (which still exist in mostly small remnant populations) and thus, nature conservation is important and should be of priority in this region (beyond of Tsavo and other dryland regions, see Habel et al. 2016); (ii) Due to demographic pressure and the need of land for subsistence agriculture, as well as the planting of exotic trees in plantations caused a severe reduction of the original pristine cloud forest, with negative effects on flora and fauna, but also on various ecosystem services and thus the human well-being (see Pellikka et al. 2009 and Pellikka et al. 2018). In the meanwhile, even the remaining forest patches are intersected by exotic trees. Thus, habitat habitat quality is reduced, even inside of most of the remaining forest patches. Most of the remaining forest islands are very small and geographically isolated and thus do not provide enough resources for the long-term persistence of species. Representatives of the following organisations joined this workshop and provided very valuable comments and insights: Kenyan Wildlife Service, Kenyan Forest Service, Nature Kenya, National Museums of Kenya. Furthermore, representatives of our partnering universities participated: Josphert Kimatu and Patrick Kisangau Daniel from South Eastern Kenyan University; Halimu Shauri from Pwani University, and Marianne Maghenda from Taita Taveta University. After finishing the workshop, students and supervisors shifted to Taita Hills and stayed at the Ngerenyi Agricultural Campus of Taita Taveta University for the following three weeks. The Agricultural Campus is embedded in agricultural land, intersected by exotic tree plantations and some few remaining patches of indigenous cloud forest. Find below some impressions of the nice campus, with some wildlife.